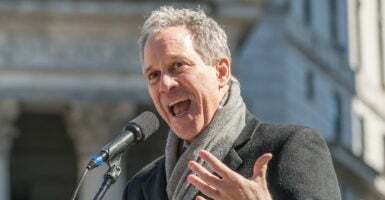 A coalition of Democratic cities and states led by New York Attorney General Eric Schneiderman sued the Trump administration Tuesday, claiming the addition of a citizenship question in the decennial census survey violates federal law and the Constitution. The lawsuit says the inclusion of a citizenship question violates both the Constitution’s command to count all persons during the census and the Administrative Procedure Act. The complaint was filed in the U.S. District Court for the Southern District of New York, the federal trial court in Manhattan. The plaintiffs claim the citizenship question “will fatally undermine the accuracy of the population count and cause tremendous harms to plaintiffs and their residents.” As such, they stand to lose federal funding and representation in the House of Representatives unless the citizenship question is removed from the questionnaire. They further allege the policy compromises their ability to comply with constitutional “one man, one vote” standards, which require equal populations among legislative districts. The suit notes minority communities are typically undercounted in the census. An internal agency report cited in the filing found 1.5 million minorities went uncounted in the 2010 census. The addition of a citizenship question, they fear, will exacerbate this problem. Former U.S. Census Bureau directors of both parties have historically supported the exclusion of questions relating to citizenship and legal status on this basis. They fear these risks are magnified by the administration’s hawkish immigration positions, which could incentivize noncitizens to lie on census forms or avoid the process altogether. “These well-documented risks of adding a person-by-person citizenship demand to the decennial census are heightened in the current political climate because of President Trump’s anti-immigrant rhetoric and this administration’s pattern of policies and actions that target immigrant communities,” the lawsuit reads. It also criticizes the agency process by which the question was added, claiming the decision was made without informed, well-considered input and contravenes decades of established policy. Such action is arbitrary and capricious, in violation of the Administrative Procedure Act. The Trump administration will file its response in the coming days. In a memo to the undersecretary for economic affairs at the U.S. Department of Commerce, Secretary Wilbur Ross explained federal prosecutors need accurate and complete citizenship data to enforce voting rights laws. The Commerce Department oversees the Census Bureau. White House press secretary Sarah Huckabee Sanders previously denied the decision was made at the president’s bidding. The plaintiffs include New York, Connecticut, Delaware, the District of Columbia, Illinois, Iowa, Maryland, Massachusetts, Minnesota, New Jersey, New Mexico, North Carolina, Oregon, Pennsylvania, Rhode Island, Vermont, Virginia, and Washington; and the cities of Chicago, New York, Philadelphia, Providence, San Francisco, and Seattle; and the U.S. Conference of Mayors.